Eileen Cahill is a junior in the College majoring in Biology and minoring in Art. When Eileen is not studying, she loves to stay active with martial arts (Judo or Krav Maga, anyone? ), yoga, and running as well as drawing and designing art pieces. Part of her desire to study abroad in Australia is because she can easily imagine herself strolling through the warm climate and navigating through unforgettable scenery. In Australia, she hopes to study the biological effects of urban lifestyles on both mental and physical health as well as on the environment. As an artist, she hopes to open her mind to new perspectives on culture, ethics, and visual communication. Another aspect of her trip that she particularly looks forward to experiencing is the unique culture that derives from a rich history of settlers and indigenous peoples and East/South Asian influence. Eileen looks forward to encountering the Aussie way of life at the University of New South Wales and writing about how her experiences develop her perspective as a whole. Alicia is a senior in the School of Foreign Service, majoring in International Political Economy. Originally from China, she went to high school in Singapore before heading over to the States, and is now spending her senior fall semester in Doha, Qatar. On campus, she used to work for Hilltop Consultants as a project manager, write for the Hoya, and was involved in GUSIF (Georgetown University Student Investment Fund). She is really excited to be in Qatar and to explore a part of the world that she had never seen before. She looks forward to having many food adventures, meeting new friends, learning about new people and religions, and appreciating everything that her last fall semester in college has to offer. Susannah is a junior in the School of Foreign Service majoring in International Politics with a certificate in Women’s and Gender Studies. She is from the great state of Texas and will be studying at Universidad Pontificia Comillas in Madrid this semester. On the Hilltop, Susannah is a part of the Institute for Politics and Publics, a consultant for Hilltop Consultants, and a member of Delta Phi Epsilon. She looks forward to improving her Spanish (it’s so-so right now), exploring the Prado (she would really be an art history major), and eating tapas. Susannah read the OGE blog as a prospective student and is so excited to have the opportunity to contribute. Nicholas Gardiner is a junior studying Chinese with minors in government and psychology. He is participating in the ACC Program at Minzu University, Beijing. Born and raised in Colorado, Nick is an avid skier and also enjoys camping, hiking, and recreational flying. At Georgetown, Nick is involved with several groups, including the GU Grilling Society, the GU Mexican Student Association, and InterVarsity Christian Fellowship. This is his first visit to China, so he is eager to improve his Mandarin skills while experiencing firsthand the culture, food, and lifestyle of Beijing with his classmates and host family. Having studied international development on his gap year with Thinking Beyond Borders, he hopes to draw connections between his studies and the challenges surrounding the significant social and economic changes occurring in China. Sarah is a Junior in the School of Foreign Service majoring in International Politics. She originally hails from Syosset, NY, and will spend Fall 2016 studying at Trinity College Dublin. Back at Georgetown, Sarah is a member of The Philodemic Debate Society and the 7:30 Mass Choir, though over the past few years she has been marginally involved in a variety of other groups. She also enjoys pretending to be an English major. Sarah is excited to explore her Irish heritage and immerse herself in Irish culture, literature and arts this semester. Furthermore, she looks forward to studying and observing European politics at a crucial time for the future of the European Union. Kira is originally from right outside of Boston. She is majoring in Government with minors in Spanish and Economics. On campus she is very involved with Club Filipino and loves to tutor young ESL students with The DC Schools Project. She is excited to be studying in Santiago, Chile where she will be living in a home stay. She could talk about food for hours so she is excited to see what Chilean food is like! A native of Fairfield, Iowa, Makayla is a junior in the SFS majoring in International Politics with a concentration in Security Studies and a certificate in Women’s and Gender Studies. When on the Hilltop, Makayla can be found meeting with SAC groups as a Commissioner, writing speeches with GSWAG, or creating theater in Poulton Stage III with Mask and Bauble. Makayla plans to take advantage of Strasbourg’s location as the official seat of the European Parliament and Council of Europe to learn more about these important institution, improve her french and (hopefully) get to know new people from different backgrounds, and, as a foodie, try all of the new foods (the best part). Over 100 years ago, Makayla’s family imigrated from this region and she hopes to find more about her ancestors and the history of the region. This will be Makayla’s first time outside of the country and she’s nervous but ready to break the Georgetown bubble in unique and exciting ways overseas. Katherine Leopold is a junior in the College majoring in Justice & Peace Studies with a concentration in Health & Justice and minoring in Biology. She dreams of becoming a doctor so that she can keep exploring the endlessly intersectional fields of social justice and healthcare. Katherine cannot wait to compare and contrast the Danish healthcare system with the American healthcare system. She hopes that her broadened perspective will help her as she leads an alternative break trip focusing on health disparities to NYC next spring. Katherine will miss searching for mermaids and sharks with her students as a swim instructor at Yates. She will also miss many Georgetown communities like GIVES, DC Schools, Project Sunshine, and FOCI. Katherine’s prospective Danish adventures include but are not limited to: getting kaffe (coffee) with a Dane, gazing off the cliffs of Jammerbugten, marveling at the wonders of European transportation, and making new friends. My name is Ian Sinclair, a native Chicagoan 20 years of age and an incoming junior at Georgetown University. I am a history major and philosophy minor obsessed with all types of music and hold a craving to discover new places never seen by me or any of my peers, such as South Korea. I will be studying my fall semester abroad at Yonsei University in Seoul, South Korea as a history major and will make my way around East Asia throughout my time overseas. I have zero experience with the Korean language and culture, so I am in for one wild rollercoaster of a ride. Shaked is originally from Netanya, Israel. She is majoring in Science, Technology and International Affairs in the SFS, and is a Global Business Fellow. She will be spending her junior Spring in The Beijing Center. At Georgetown, Shaked is a tour guide, an account manager for the Hilltop Microfinance Initiative, and a member of Delta Phi Epsilon. Shaked hopes the TBC program will enable her to improve her Mandarin skills, and also looks forward to the Yunnan Province trip and celebrating Chinese New Year in Dali. Kara is a junior in the College majoring in Government and French with a minor in journalism. Kara has dreamt of studying in Paris since she was 12 years old and is excited to live out that dream this semester. While studying at Sciences Po Paris, she is eager to compare how American and French laws treat and regulate new media, practicing her French and asking French people why they dislike peanut butter as much as they do. Noah Buyon in a junior in the College majoring in history and minoring in journalism and theology. He is from White Plains, NY. On the Hilltop, Noah helps edit the Georgetown Voice and spends a lot of time in Lauinger Library, which he is sad to be leaving for a semester. Despite not speaking a word of Hungarian, he’s eager to get to know get lost in Budapest. Moreover, Noah is excited to be living and observing in Hungary at a time of great change in that country and the broader East-Central Europe region. Patrick Drown is a junior in the School of Foreign Service majoring in Culture and Politics focusing on environmental issues in the Middle East. He hails from Easton, Massachusetts, and on campus can be found at the Office of Sustainability trying to fix bicycles, giving admissions tours, or on first floor of Lauinger Library trying to find innovate ways to memorize Arabic vocabulary. Having struggled through Arabic for 5 semesters at Georgetown, he can’t wait to finally put his Arabic skills to use whilst living with his host family, navigating the streets of Amman, and making new Jordanian friends over Hookah. Patrick hopes to better understand how environmental conflict has contributed to instability in the region and the extent of Syria’s refugee crisis and it’s impact on Jordan. Read about his adventure – promised are humorous self-deprecating comments on his Arabic speaking skills and run-ins with Jordanians who just don’t know what to make of him. Jack is a junior in the College majoring in Government and minoring in Spanish and Economics. He is a native of Minnesota and will be studying at Universidad Complutense in Madrid this semester. During his time as a Government major, he has become increasingly drawn to the study of actual and perceived social differences that divide groups of individuals in society and intends for his blog to be informed by this line of academic inquiry. Over the semester, he will strive to provide a perspective on the experience of social difference in Madrid and the country as a whole, with particular focus on several current domestic political movements. In short, he is excited to explore the culture and history of Spain for the first time and to supplement his academic interests with real world experience. Outside the classroom Jack enjoys bonfires, theater, and fancy libraries. Barbara Anne Kozee is a junior in the SFS majoring in International Political Economy with a certificate in Latin American Studies. At Georgetown, you can find her tossing the disc with the Ultimate Frisbee team or at a concert with friends. She is a member of Georgetown Solidarity Committee, Active Minds, and a writer for The Georgetown Heckler. Barbara Anne can’t wait to explore the natural beauty that the Dominican Republic has to offer and to trade the brutal DC winter for a more tropical climate! She looks forward to exploring the intersections of migrant and racial justice in the DR and to learning about how these play into the unique Caribbean identity in a Latin American context. Hopefully she will emerge from her study abroad a professional merengue dancer—but no promises. Kate Riga is a junior in the college majoring in American Studies and minoring in Classics. She hails from Philadelphia and is spending this spring semester at Georgetown’s Villa Le Balze in Fiesole. She enjoys geeking out at ruins, getting lost, and eating great quantities, all interests which she hopes to pursue in Italy. Since all of her knowledge lies in Ancient Rome, Italy’s modern incarnation will be a wildly new adventure. Back on campus, she’s leading an Alternative Spring Breaks trip to New Orleans, plays on the club lacrosse team, and works for a social justice initiative. She can’t wait to leave her star-spangled comfort zone and see what Florence has in store. Originally from Los Angeles, California, Bethan Saunders is a junior in the School of Foreign Service. She is majoring in International Politics with a certificate in African Studies. Following her interest in sub-Saharan Africa, she will be studying abroad at University of Cape Town in Cape Town, South Africa. In addition to taking classes on South African government and politics, Bethan will be continuing her research on gender and transitional justice as an Undergraduate Research Fellow with the Mortara Center for International Studies. At Georgetown, Bethan is part of the Georgetown University Student Association, the Institute for Politics and Public Service, and the foreign service sorority, Delta Phi Epsilon. Outside of classes, Bethan is a member of Chi Alpha, one of Georgetown’s Christian ministries and hosts a weekly radio show featuring swing and jazz music. While she will certainly miss life in DC, Bethan is looking forward to expericing life abroad in such a dynamic and vibrant country like South Africa. Angela Williams is a rising junior in the College, majoring in Sociology. A native of Oak Park, Michigan, Angela enjoys writing poetry, reading books, and vibin to good music. At Georgetown, she is the co-director for Georgetown University’s Corpus Collective, the premier spoken word group on campus, and is a mentor for four underclassmen. She is looking forward to studying at University of the Western Cape in Bellville, South Africa. Aside from studying, she plans on writing poetry, taking fantastic pictures, and living in the moment. This will be Angela’s first time outside of the country and she is excited to share this journey with you. Katherine is a junior in the School of Foreign Service and is a Regional Studies Major focused on the interplay of democracy and religion in Middle East. She is from Utah but attended boarding school at The Hotchkiss School in Connecticut before coming to Georgetown. Her passion for traveling and learning about new cultures, which has led her to study in Australia, India, Jordan and now in Rabat, Morocco. She will be attending the SIT Multiculturalism and Human Rights program in Morocco for the fall of 2015. She is so excited practice her Arabic and French, try a new cuisine, live by the ocean, and immerse herself in a new culture. The academics of the program, with its focus on field research will give her the opportunity to both use her Arabic outside the classroom and delve deeper in to the issues of citizenship and democracy. Outside of the school she enjoys dancing, playing tennis, and catching up on television shows. Emily DeMaio is a junior in the School of Nursing and Health Studies majoring in nursing and also completing the pre-med requirements. She is originally from Georgia and has a strong appreciation for good food and the outdoors. She looks forward to exploring Ireland and hopes to play basketball at UCD. (She is a captain for the Georgetown Women’s Club Basketball Team.) Emily’s study abroad experience will revolve around clinical rotations in both private and public Irish hospitals. She will complete Care of the Adult (Medical/Surgical) and Mental Healthcare while in Ireland. She is eager to compare and contrast the healthcare delivery system of Ireland with that of the United States as well as learn cultural competence by caring for Irish patients. Caroline Farr (MSB ’17) is a native of Virginia horse country and is excited to trade cupcakes for cannolis while she studies abroad in Italy this semester. She is a Finance and Marketing major who is looking to get in touch with her creative side by exploring art and architecture in the Renaissance city of Florence. While the DC area has always been home to Caroline, she can’t wait to reside in a new city. She looks forward to wandering the streets of Florence, ducking into gelaterias and indulging in Italian cuisine along the way. Nicole is a native New Yorker, majoring in Government and Justice & Peace Studies as well as minoring in Spanish. She will be spending her fall semester in Madrid, studying at the Universidad Pontificia Comillas. At Georgetown, Nicole plays club soccer and loves to treat herself to cupcakes. Next spring, she will be leading an Alternative Breaks Program trip to the Rust Belt. The trip will focus on the urban renewal efforts led by individuals, communities, and government to revive these Midwestern cities. Nicole looks forward to experiencing Madrid in its entirety, learning how to cook traditional Spanish meals, navigating the Metro, and studying Spain’s unique political climate while living in the country’s capital. Marisa is a junior in the School of Foreign Service majoring in International Politics with a concentration in International Law. Her academic passion lies in the exploration of intersecting political systems, cultural norms, and legal practices on a global scale, particularly in regard to women’s international rights. At Georgetown, she has had the pleasure of writing for both the Voice newspaper and the Journal of International Affairs, taking laps around the National Mall with the running club team, and assisting one of her professors with research on the variance in family leave policies in Latin America. She is looking forward to exercising her Spanish proficiency, passion for travel, and serious love of new food while studying in—and exploring—the vibrant city of Buenos Aires. Misty Li is a rising junior in the McDonough School of Business, majoring in Finance and International Business. A native of Silicon Valley, Misty loves creative ideas, cool people, and cold-brewed coffee. To get her fill of all the above, she is traveling to Copenhagen, Denmark with DIS for Fall 2015. At Georgetown, Misty organizes initiatives as the co-Vice President of MSB Academic Council, designs solutions with Hilltop Consultants, and owns it with the lady mafia team of the OWN IT Summit. She intends to spend her days in Copenhagen taking classes and mastering the Danish letter “Ø” and her nights eating local dishes, hitting up neighborhood music venues, and holing up in quaint cafes. Her current goals include learning how to use Danish to order her complicated coffee drinks and keeping her Instagram game strong abroad: @mistyness. Matt is a junior in the School of Foreign Service studying International Politics with a Concentration in International Law. Originally from Bloomfield Hills, Michigan, he is thrilled to be in the Middle East for the first time, studying abroad at Georgetown’s School of Foreign Service in Doha, Qatar for the fall semester. Matt’s extensive travel experience in Europe, Central America, and China led him to Georgetown to study International Affairs. He never stops appreciating being in Washington, DC at the center of it all. While at Georgetown, he’s developed a passion for fostering religious toleration in the Middle East and improving the lives of those living in developing countries. Outside of school, Matt participates in Bible study, plays piano, and actively follows professional and college sports. Nikki Wadley is a junior in the College pursuing a History major with concentrations in Latin America and Europe, as well as minoring in Spanish. Originally from Long Beach, California, Nikki is an avid traveler and is looking forward to experiencing life abroad for an extended time in such a unique country. She is excited to give the Georgetown community a glimpse into what Cuba is really like, especially at this time of historical transition. Nourhan studies at Georgetown University School of Foreign Service in Qatar. Originally from Egypt, she is spending the spring 2015 semester at University College London. Majoring in International Politics, her studies and writings tend to focus on the history, and domestic and international politics of the Middle East. Her academic interests, nevertheless, span a wide range of topics, including gender, development, African-American history and culture, colonial history, Islamic law and history, as well as American and European foreign policy in the Middle East. Her love for research and academic writing inspired her to work as a research assistant at the Theology and History departments, and as a Writing Peer Tutor and History Writing Fellow at the Writing Center. While in London, if she is not doing online research at her desk, she can be found outdoors, enjoying the sunshine and contemplating how political, economic and social relations play out in public spaces. 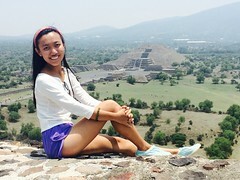 Caroline Yarber is a Florida native majoring in Chinese and Government and minoring in Korean in the College. She spent her junior fall in Beijing, China and now is spending the spring in Seoul, Korea. At Georgetown, Caroline plays in the orchestra and spent the last year working for the OGE. Caroline looks forward to volunteering with North Korean refugee children in Seoul to gain insight for her future (dream) career in international human rights. Iliana Lang is a junior in the College studying Environmental Biology and Women’s and Gender Studies. Her interests lie in understanding the intersection between gender and sustainable livelihoods. She enjoys participating in any outdoor adventure activity, trying new foods, and learning from new cultures and people. Thrilled to be in Melbourne, Australia, she is eager to engage with a very progressive culture in the city with the world’s best coffee and many diverse views on life. Plans to learn about the conservation efforts in Australia’s unique landscapes and aquatic wonders are also in the works! Katherine McIntire is a junior in the College studying Biochemistry, with a minor in Mathematics. At Georgetown, she does research in a biochemistry laboratory and plays club volleyball. She is originally from Salt Lake City, and loves to hike mountains and read. Katherine is excited to explore the city of Edinburgh and scenic Scottish highlands, as well as travel through the rest of Europe. Allison Saunders is a junior in the College majoring in Biology of Global Health. A native of Maine, she enjoys hiking, playing the violin, and listening to country music in her spare time. At Georgetown, Allison works as a teaching assistant in the biology department, conducts cellular biology research, and volunteers as an emergency medical technician with GERMS. She aspires to eventually attend medical school and pursue a career in biomedical research. This spring semester, Allison is studying in Australia at the University of Sydney, and she is so excited to be sharing her experience through the OGE blog. She is looking forward to adopting the laid back Aussie way of life, trying her hand at surfing, and traveling around Australia! Samantha Macfarlane is a junior in the School of Foreign Service, majoring in Culture and Politics. She hopes her studies in ‘cultural identity in international development’ will land her a job working hands-on to help developing countries. She loves to be active and involved, but this year Samantha is taking a break from her packed interning-working-tutoring-step-team-captain life at Georgetown to drink tea in Africa – Morocco in the fall and Senegal in the spring. She is excited to work on her French proficiency and to return to DC with a few new languages under her belt (or at least the basic phrases)! Bardia Rahmani is a sophomore in the School of Foreign Service (SFS) majoring in Science, Technology, & International Affairs. His interest in foreign affairs and international security has lead him to work as a project leader for the Georgetown Global Microfinance Initiative and a research assistant for the Government Department at Georgetown. A reader and writer in his spare time, he hopes the city of Paris, which inspired Camus, Hemingway, and Fitzgerald, will get him to do some writing of his own. Or at least provide a nice backdrop for a semester of writer’s block. Bardia has pent 20% of his life in London, 30% in Ithaca, NY, and 50% in Cleveland, OH. He is 100% Persian. Allie Canal (College ’16) hails from the Philadelphia suburb, Cherry Hill, NJ, and is beyond excited to begin her adventure in Florence, Italy during the 2014 fall semester! Majoring in English with a double minor in Journalism and Business Administration, Allie has been a senior writer for the online magazine, HerCampus Georgetown, and can’t wait to continue blogging for OGE. When she’s not hammering out a last minute paper, you can find her cheering on the Philadelphia Eagles or singing with the a cappella group, Superfood. While abroad, Allie hopes to fix Jersey’s reputation with the Florentines (thank you Jersey Shore Season 4), eat a lot (A LOT) of pasta and pizza, and fully immerse herself in a culture that is so unlike her own. Joanie Abbot is a junior in the SFS majoring in Science, Technology, & International Affairs with a concentration in Business, Growth, and Development. In DC she can be spotted singing with Superfood a cappella and the Chamber Singers on campus, and jogging around the monuments with the running club. Her interest in Spanish grew from exposure to Latin American culture as a teenager. Last summer, she had a fantastic time studying in Quito, Ecuador. This fall, she looks forward to developing her Spanish skills from a new and different cultural perspective at la Universidad Pontificia de Comillas. She is particularly interested in studying Spanish business culture. While not studying and traveling, she hopes to spend a lot of time running in el Parque de Buen Retiro and exploring the Prado. Hailing from the Chicago suburbs, Taylor is a junior in the College, pursing a Chinese major and an Economics and Theatre and Performance Studies double minor. She is the Co-Associate Producer of Georgetown’s Black Theater Ensemble, and she primarily spends her spare time working on dramatic productions, both onstage and behind the scenes. She also enjoys rock music and epee fencing. She fell in love with learning foreign languages while studying French in high school, and has since become fascinated with Chinese language and culture. Taylor can’t wait to explore Shanghai, and she’s thrilled to have the opportunity to share her adventures with her friends, family, and readers of the OGE blog. Meagan Wang is a junior in the McDonough School of Business, majoring in International Business. From Los Angeles, she loves enjoying the outdoors and eating her way through new cities. Why Edinburgh? Well, they speak English for one, and two, the city is a cultural hub where ideas and thoughts are constantly being exchanged. Excited to live in a foreign country, Meagan hopes to capture at least some of her experiences in writing. Looking forward to some meat and potatoes. Molly Egilsrud is junior in the School of Foreign Service studying Science, Technology, and International Affairs with a concentration in Energy and the Environment. Molly hails from St. Louis, Missouri and is a huge fan of the 11-time World Series Champion St. Louis Cardinals. She will be studying abroad in Córdoba, Argentina for the Spring 2014 semester, spending three days a week studying at la Universidad Católica de Córdoba and two days volunteering with a community in the city. A devout Catholic, Molly is excited to explore Argentine Catholicism in the wake of a homegrown pope, as well as liberation theology and comparative poverty. Most of all, she looks forward to grilling red meat, talking about philosophy, and collecting all the ridiculous Pope Francis memorabilia she can. Zoe Gadegbeku is a junior in the College majoring in Psychology and French. This academic year at she has been greatly involved in the African Society of Georgetown as well as The Fire This Time, Georgetown’s online multicultural newsmagazine. She has recently discovered her love for blogging, and is excited to document her adventures in Senegal. She is hopeful that this study abroad experience will expose her to a totally different culture and lifestyle from that which she is used to in her home country, Ghana. Katie Jane is a Junior in the School of Foreign Service majoring in Culture and Politics with a focus on the cultural roots of government types. She is originally from Houston, Texas where she likes to reinforce state stereotypes by horseback riding and using the pronoun “y’all.” She is looking forward to traveling to Buenos Aires, thus successfully eluding winter weather of any kind for almost a full year. Having only learned about the richness of the Argentine political landscape in the classroom, and through newspapers, she is excited to finally be able to experience it for herself. She is also very happy to get the opportunity to share her excursions and adventures on the OIP Blog and with its readers. Noreen Sajwani is a junior in the School of Nursing and Health Studies (NHS) majoring in Health Care Management and Policy and double minoring in Spanish and Theology. On campus, she is part of the South Asian Society (SAS) Board and also engages in several inter religious efforts, such as serving as the Chair of the Interfaith Student Association this past fall. She also enjoys spending her time as a Blue and Gray Tour Guide on campus, teaching many prospective students about the little-known facts of Georgetown. Noreen hopes to become fluent in Spanish when coming back from her study abroad experience in Madrid and learn specifically about the theological underpinnings of the country in present time.